Dozens of people are still believed to be inside Grenfell Tower, according to new figures released by police today. Commander Stuart Cundy said 58 people who were in Grenfell Tower on the night of the blaze are missing and presumed dead. This includes the 30 already confirmed dead. 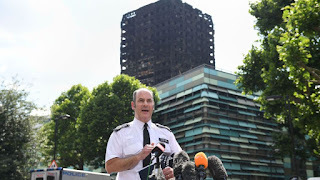 In his latest update on the recovery operation, Mr Cundy said a search of the burnt out building in North Kensington had resumed after a brief pause because of fears about the safety of the structure. As he warned that the death toll could rise further, he identified a first victim as 23-year-old Mohammed Alhajali. Mr Cundy said: "Sadly, at this time there are 58 people who we have been told were in the Grenfell Tower on the night that are missing, and therefore sadly, I have to assume that they are dead." The commander, who said video and photographs from inside the tower would be released on Sunday, added: "That number 58 may change. I really hope it won't, but it may increase. "Our focus has been on those that we know were in Grenfell Tower. However, there may be other people who were in there on the night that others were not aware were there. "That is also an absolute priority for the investigation - to establish who they may be." Mr Cundy also appealed to anyone who may have escaped from the building but has yet to come forward, to make themselves known the police. He said he was not interested in knowing why they had left it so long to make themselves known but it was vital police knew they were safe and well. Of the 58, he said 30 were confirmed dead. 16 bodies have been recovered from the Tower and taken to a mortuary. Mr Cundy said the Metropolitan Police investigation into the fire would look at the building and its refurbishment in 2016 and promised there would be prosecutions "if there is evidence". He said: "The investigation is a police investigation. We investigate criminal matters. The investigation will identify any criminal offence that has been committed. It will be wide ranging. "It will go to establish the answers of what happened in the fire and how it spread, it will look at the building itself, it will look at the refurbishment as well. "Our criminal investigation will identify any criminal offences that have been committed. Wherever we can, we will bring people to justice if there is evidence. It is completely and wholly inappropriate for me to talk about details of the investigation which may subsequently jeopardise any criminal proceedings."